History: Designated in the early 1950s, originally extended east through Jal to the Texas border. The adjoining route in Texas was later redesignated as TX-176. In the 1988 renumbering, NM-8 was extended east to Jal and the route east of Jal became NM-234. Too bad, Texas. But then, in May 2006 New Mexico reversed its renumbering. NM-8 was terminated at its junction with 176, and 176 took over the route in Eunice formerly occuped by NM-207 and was extended east to Texas over former NM-234. Comments: More reversals like this of the 1988 numbering, please. It's better this way, really. History: The original routing for NM-51 and, east of the junction with the road to Elephant Butte Dam, NM-52. A bypass was constructed at some point to take NM-51 south of this road to join with NM-52 east of the original junction. The westerly part of this road was removed from the state highway system for a time, but restored 1988. Comments: This road loops north and east from NM-51, passes by the former access road to the dam (NM-195 before the dam road was closed), and turns east by the settlement around Elephant Butte Marina to rejoin NM-51. History: Established mid-1930s. By the 1940s this was an extension of NM-42. In the 1988 renumbering, it became NM-247. History: Established as a state highway probably in 1988, though it likely existed prior to that time. Comments: This road now carries NM-195 through traffic since the road over the dam was closed in 2001. Prior to that, it carried westbound NM-195 traffic when one-way traffic over the dam was permitted. History: The eastern part of U.S. 180 (I) where it "bounced" off U.S. 80 at Lordsburg. This route was eliminated by 1934 when U.S. 70 was realigned onto its current route. At that time, this route became NM-180. In the 1940s, it was extended south to NM-79 near the Mexican border. By the late 1950s, this extension was removed (the part south of Animas became NM-338, but currently is not a state route). In 1962 when U.S. 260 was renumbered as an extension of U.S. 180 (II), this route became NM-90. 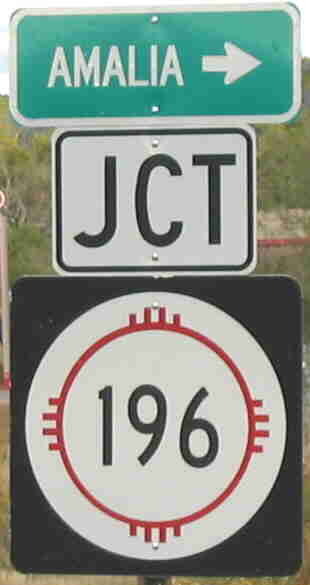 The part from Lordsburg to Silver City still has this designation, but the part east of Santa Clara became NM-152 in 1988. 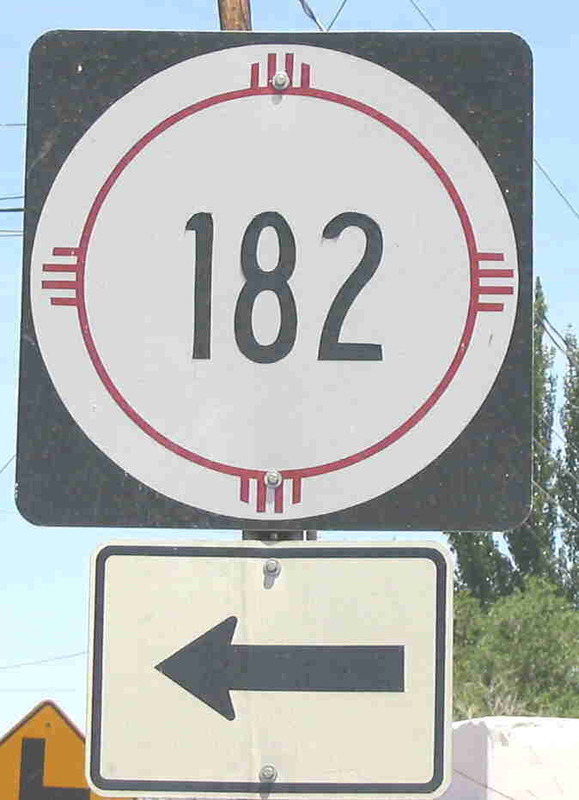 Comments: This kept the 180 designation even after U.S. 180 (II) was extended into southeast New Mexico in the 1940s. Either New Mexico was not enforcing the "no route number duplication" rule at that time, or the state route inventory number for U.S. 62-180 was 62. History: Formerly part of U.S. 85, likely designated as this in 1988. Comments: A close frontage route for I-25. The frontage road FR 2028 continues north from the end of this route and deadends at one of the large canyons crossed by I-25 in this area. Photo taken at junction with NM-28 at La Union. Route marker appears much newer than the directional arrow. History: Apparently split off when NM-273 was rerouted in the late 1990s or early 2000s. Comments: Not evident on any maps I've seen except that the 2003 NM state map shows the state highway through La Union ending south of that town. Otherwise, shown on Yahoo maps. I confirmed this in person, and NM-273 was definitely rerouted over former NM-319. History: Likely established in 1988. Like NM-182, also originally part of NM-273. Comments: Follows La Union-Vinton Road. History: Established mid-1930s. After 1940 became part of the extension of NM-78 to U.S. 60, then removed from state highway system by 1988. Now NFS 30. Comment: NM-184, 185, 186 and 187 are all shown only on a 1936 map and the official 1940 NM State map, with uncertain ends for these routes. Whether these were established as state highways, turned back and reestablished with their later designations I have no way of knowing. History: Established mid-1930s. After 1940 became NM-59, which it is today. Comments: Another of the 184-187 routes shown on the 1936 map. History: Originally designated as U.S. 85 in 1927. In 1988, when U.S. 85 was eliminated as a marked route, this became NM-185. Comments: U.S. 85 was a separate route from I-25 between Las Cruces and T or C, separated from the Interstate through much of this length by the Rio Grande. So, it was an important regional connector, even if not part of a major through interstate route. This segment of old 85 was broken up into two different routes, 185 and 187, separated by what was formerly a short common section with NM-26. History: Established mid-1930s. After 1940, renumbered as an extension of NM-61. In 1970, the southern part became part of NM-35. By 1988, the northern part through the mountains became NFS 150. History: Originally part of NM-404 since the 1970s, this segment was left in the state highway system after the portion of 404 between the Rio Grande and NM-460 was removed from the state highway system in the late 1990s. This segment received a new designation, consistent with the 180-series routes designated since 1988 in this area. History: Like NM-185, this was part of U.S. 85 from 1927 to 1988. It was given a different number because of the short common section at Hatch with NM-26. History: Probably in the 1960s, established as a bypass for U.S. 85. (Actually signed "Truck Bypass," no number). In 1988, given a separate route number. Comments: Although it is a straight-ahead extension of NM-185, it has a separate route number. History: Probably established as a state highway in the late 1950s as part of NM-227. In 1988, because of a short common section with NM-478 in Vado, this part of 227 was given a separate designation. History: Date of establishment not known, probably pre-1988 due to its number (otherwise it would probably be a 2xx route). Comments: My Benchmark map shows NM-409 extending south from Bottomless Lakes and terminating near this road. However, no other map verifies 409 having been extended south, including the 2003 New Mexico highway map. So, I'm not currently of the opinion that 190 is a piece of old 409. It is too short to show on most maps and therefore could have been in existence for some time. History: Probably established as a state highway in the late 1950s as part of NM-228. In 1988, because of a short common section with NM-478 in Mesquite, this part of 228 was given a separate designation. History: Established early 1950s from old NM-58 (now U.S. 56) north to Farley only. Not shown as a marked route on several maps from the mid-1950s until the mid-1970s, when it is shown in its current length. Improvements: Two-lane, paved except center section, which is gravel. Comments: If it disappeared from the state highway system, it is unusual when compared with other routes that did this that it had the same designation when restored. History: Established along Rio Grande Blvd. in the early 1950s. By mid-1980s, only the portion in the city of Alameda remained. The route does not show on the Albuquerque detail map on the 2003 New Mexico highway map, and thus appears to have been removed from the state highway system in the early 2000s. History: Only shows on a map I've seen from the early 1940s and the 1940 official NM map. Appears to have been an interim designation for a realignment of the southern end of original NM-15. The north end is uncertain because the map was not clear on exactly where it ended, but original NM-161 (which later became the south end of NM-41) intersected at Claunch. It may have reverted to NM-15 (the two routes are not shown in parallel at any time) and in any event, the road soon became the extension of NM-10, and is now part of NM-55. History: The western part of this route has been a state route since the 1920s, when it was part of U.S. 85. By the early 1940s, U.S. 85 was realigned to a more westerly route, and this became part of NM-52. Renumbered in 1988. The segment over Elephant Butte Dam became one-way eastbound at some point with westbound traffic having to take NM-51 and NM-177 to join this route east of the city of Elephant Butte. Although shown as part of the state highway, the route over Elephant Butte Dam was closed in 2001. Comments: The routing over the dam is interesting because the top of this very old dam (constructed 1912-16) is barely wide enough for one vehicle. I don't know what traffic control was used to allow two-way traffic, but at some point the dam was made one-way eastbound with westbound traffic using NM-51 and (what is now) NM-177. The dam route is now closed. History: Established 1940s, originally ran to the village of Amalia. In 1988, extended to the ski area. History: Established early 1950s, the west end of this road was originally at the village of Penistaja. In the 1960s, it was aligned more southerly to the village of Torreon. Today, it connects with BIA roads that cross the Navajo Reservation from Crownpoint. History: Established in 1988, along with NM-143, as part of a highway jurisdiction agreement with Luna County. Its northern terminus was originally NM-497, but the east end of that route was consolidated with NM-143. Comments: Tracking this route has been confusing because it appeared to be an extension of NM-497 (now 143). It actually runs south off 143 about 1/2 mile before that route enters Rockhound State Park. This route connects to Spring Canyon State Park. History: Established by the mid-1930s. Combined with NM-21 in 1988, which designation it now bears. History: Constructed late 1990s, became part of state highway system in 2000. Part of this route was formerly Eddy County Highway 604. Comments: This is the Carlsbad Relief Route. Like the Santa Fe Relief Route, it probably received Federal funding to provide a bypass for trucks carrying nuclear waste from Los Alamos to the nuclear waste forever storage facility in salt beds east of Carlsbad.